Over the last week we've been having a fox squirrel at our feeders at the nature center. We don't see them very often as they are more solitary than grey squirrels. They are slightly larger and you can see the belly is reddish like a fox instead of white like a grey squirrel. Interestingly, the habits of gray squirrels and red squirrels are reversed here in Minnesota and more southern cities. Several people I have spoken with who used to live in states south of Minnesota say that it is fox squirrels who frequent the feeders and gray squirrels are only seen in the woods. I wonder why that might be? The range of the fox squirrel does extend further to the west than the gray squirrel so it is possible these people lived on the very western edge of the gray squirrel range and as such they were fewer in number which allowed the better adapted fox squirrels to increase in number. More fox squirrels would mean that more would be found at feeders. This does not explain why gray squirrels would be less frequest visitors to feeders. I would think feedres woud allow them to survive better outside or at the fringes of their range. The number of redpolls under the feeders at the nature center has increased over the last week as well. We're now seeing a flock of about 21 birds every day though with the warm spell we're seeing I wonder if they may start heading back north. They seem to prefer feeding off the ground rather than the feeders and as Birdchick pointed out when I talked to her about it she said, "Well ya, they've never seen a bird feeder before." Good point! On my yearly bird tally I've added four new species, two of them lifers! I saw a Purple Finch at work on the last day of January and then a Northern Cardinal on the feeder at home. I'm slowly making our open wasteland of a yard more bird friendly and the fly-through feeder is a favorite addition for the birds. Today, Sunday February 9th I had the opportunity to sneak away for a little birding as my inlaws were in town and watching Camden. There was a report of a rare bird just down the street from my house so I had to go. I didn't realize until I got there that the bird was hanging out about 3 houses away from the house of someone I know. That was pretty fun. There were a lot of people there and the neighbors were wondering why on earth there street was full of people with binoculars, spotting scopes and huge camera lenses as long as my arm. The bird in question was a Varied Thrush which is related to the American Robin and usually only found in the Pacific Northwest. A lone male has been hanging out with a flock of robins and eating crabapples. After waiting abot half an hour it finally showed up but only briefly. I managed to get a photo from a long way off. This was through a 480 mm lens and then cropped in. 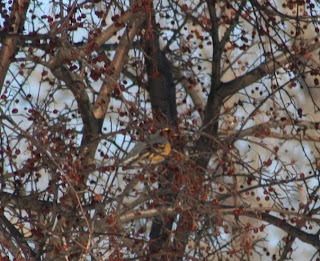 Unfortunately, the focus is on the berries in front of the bird but you can see it clearly and tell what it is. This is from over 200 feet away so it was a bit hard to judge focus and bird flew off just seconds after I snapped this. While I was waiting for the Varied Thrush to arrive I noticed some movement at the top of a very tall spruce tree and I turned my binoculars on the cones at the top. My hope panned out. There was a beautful male and female white-winged crossbill. People have been seeing them like crazy this year but I had yet to come across any. I'd never seen one before so that was a lifer bird as well. Not bad to get two new life list birds in the span of 30 minutes on a Sunday afternoon in February.